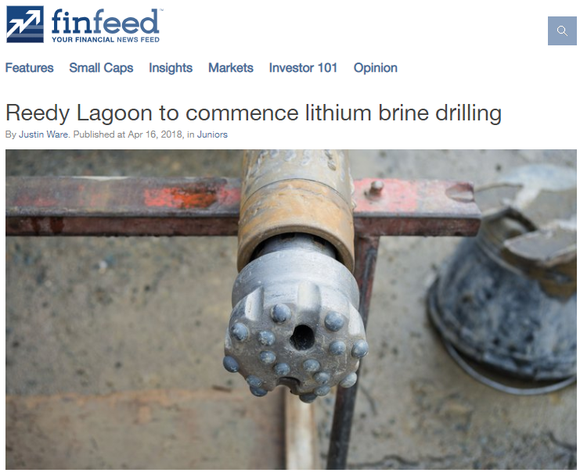 Reedy Lagoon Corp. (ASX:RLC) continues to make strides into the burgeoning lithium sector, with its the Nevada lithium brine assets now comprising four projects — Columbus Salt Marsh, Big Smoky South, Clayton Valley and Alkali Lake North. These projects are located in the US — one of the best jurisdictions on the planet in which to operate a mine. Outside of China, the most promising areas for finding lithium bearing brine are in the Atacama Desert in South America (Argentina, Chili and Bolivia), and in the US, around and including Nevada. However, the US is a more stable jurisdiction... it's hard to imagine it being hit with 60% inflation such is the case in Argentina at present. 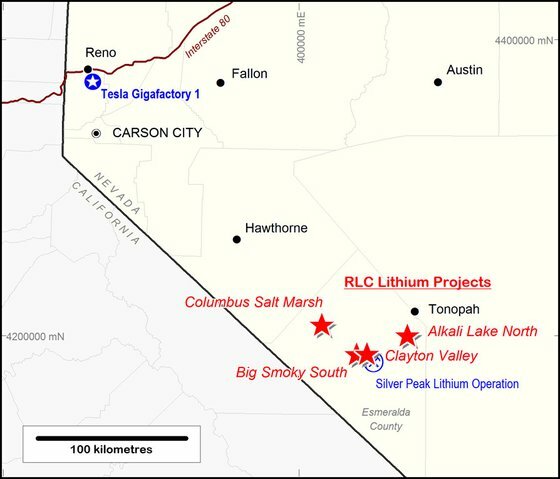 RLC’s projects are located in three large and separate ground water catchment areas in Nevada, and they are all within 50 kilometres of Albemarle Corp.'s (NYSE:ALB) Silver Peak Lithium mine — North America’s only producing lithium brine operation — which is 360 kilometres by road from the Tesla Gigafactory (lithium-ion batteries) in Reno. RLC will also be looking to generate strong margins as its end game is to develop projects to potentially reduce the costs traditionally incurred by hard rock miners. In fact, lithium from brines can be processed at around half the cost burden endured by the hard rock miners because it doesn’t need to be mined, crushed or roasted,. Deriving lithium compounds from brine sources tends to be cheaper than from mineral sources such as spodumene. Of course, the other metric that comes into play when considering a company’s earnings ability is the commodity price. As is the case with the likes of precious and base metals, revenues generated by lithium producers will always be impacted by commodity price fluctuations. This is where the lithium industry becomes very complex, but more on that later. Of course it should be noted here that because commodity prices do fluctuate, those considering an investment in this stock should seek professional financial advice and not base any investment decision on commodity prices alone. Underpinning RLC’s success in gaining access to some of the most highly prospective ground in the renowned Clayton Valley was its adoption of new regulations introduced in Nevada allowing it to progress with a view to developing a Dissolved Mineral Resource Exploration Well. Investors may have taken their eye off the ball, focusing on volatility in the lithium price rather than monitoring RLC’s promising operational developments. Much of this is to do with contentious comments regarding future demand for the commodity, which has not only placed a drag on the lithium price, but also negatively impacted the share prices of most companies in the sector. But as we said, it's what's been happening on the operational front that should be the focus, and on that note we revisit Reedy Lagoon. 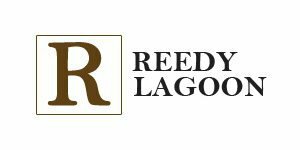 We last examined Reedy Lagoon Corp (ASX:RLC) back in March with the article, ‘RLC Sees a Substantial Nevada Lithium Find Coming into View’. Following a period of rapid licence acquisitions that resulted in a five-fold increase in the company’s share price, RLC embarked on a drilling program at its Columbus Salt Marsh Project. The drilling campaign at Columbus Salt Marsh was aimed at gathering data on a highly conductive zone extending from 600 metres to more than 1000 metres below surface. The first drill hole intersected extensive thicknesses of locally derived clastic sediments and volcanic ash and tuff deposits which are interpreted to be derived from the eruption of Mt Bishop and the Long Valley Caldera 110 kilometres to the west. The Mt Bishop Tuff is believed to be the source of much of the lithium in Clayton Valley and the presence of extensive deposits of these tuff and ash beds in the current drill hole was considered significant. A pump test was conducted approximately 61 metres above the target zone in order to determine if brine was present. An aquifer within a zone of tuff and volcanic ash deposits from 500 metres to 531 metres was pump tested and sampled. The aquifer was confirmed to be brine with an absence of lithium at this level. Elevated Total Dissolved Solids (TDS) and electrical conductivity EC detected in the brine was consistent with the modelled data at this depth. The blue box in the following graphic shows the approximate interval pump tested and sampled. Bear in mind that resistivity is the inverse of conductivity, implying that low resistivity equals high conductivity. While significant lithium wasn’t detected in the core samples, assays indicated that the levels were anomalous, but not commercial. In April, investors turned their attention to RLC’s exploration campaign at the much anticipated Big Smoky South Lithium Brine Project, with the company’s shares rallying about 15% in the week leading up to the commencement of drilling. 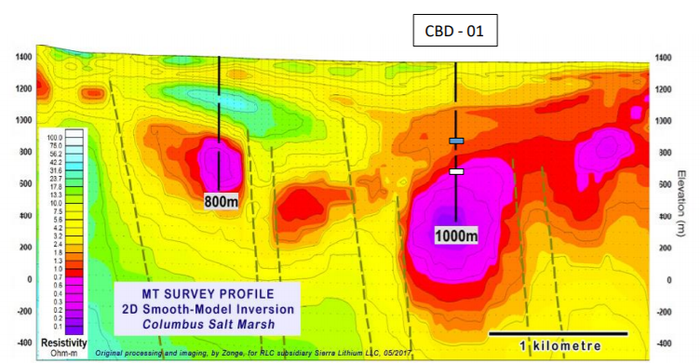 The drill program at Big Smoky South aimed to investigate a highly conductive zone extending from 600 metres to more than 850 metres below surface as indicated on the MT Survey profile below. However, Reedy terminated the hole at 401 metres when its geologists realised the prospective area for brine was above 400 metres and not below 400 metres. A number of thin volcanic ash beds were intersected in the upper part of the hole. The presence of ash beds in the hole is encouraging as such beds are generally considered to be potential sources of lithium available to be dissolved by groundwater. However, fluid flow rates were too low to allow effective sampling. Notwithstanding this development, a significant amount of technical data was gathered which has assisted RLC in understanding the location and geology of lithium brines in Nevada. Yet, it remains a speculative stock and investors should seek professional financial advice if considering this stock for their portfolio. One of the most important developments that has occurred since we last covered RLC is the staking of 112 additional placer claims over an area of 906 hectares to form the Clayton Valley project in the northern part of Clayton Valley, Nevada. 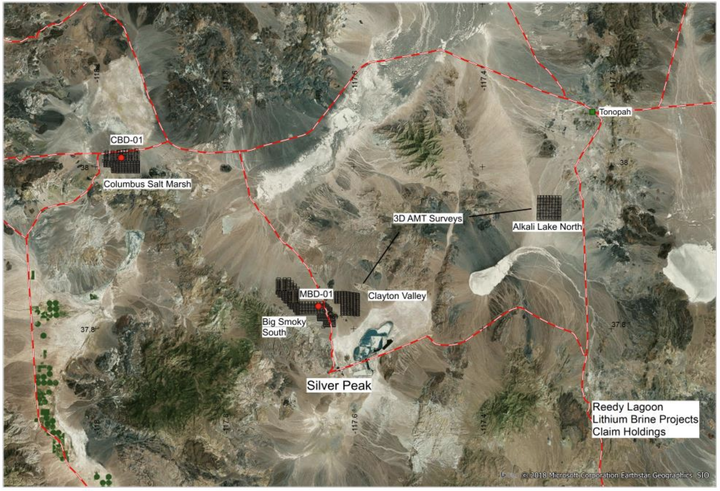 Consequently, the Nevada lithium brine assets now comprise four projects, Columbus Salt Marsh, Big Smoky South, Clayton Valley and Alkali Lake North. As mentioned, the drilling program at the Big Smoky South Project provided management with vital information regarding the surrounding geology. This data assisted the company in identifying the new claims recently staked. RLC subsequently undertook a program of geophysical surveys at the newly staked Clayton Valley property which indicated a substantial tabular conductive body, the top of which is at a depth of 250 metres with a vertical thickness of approximately 200 metres. Management interprets the conductive body to potentially comprise a 200 metre thick interval of sediments containing multiple brine filled aquifers. The geophysicist has estimated the volume of this conductive body to be one cubic kilometre, providing RLC with strong evidence regarding the presence of brines at its Clayton Valley project. The most recent work undertaken by the company incorporated surveying at its Alkali Lake North property. The company received results for the 3D Audio Magneto Telluric (AMT) survey carried out on its Alkali Lake North property. The results indicate a linear conductive body extending more than 2000 metres horizontally at a depth of about 500 metres adjacent to a major fault. Data points to a vertical thickness of over 100 metres, and the company interprets the conductor to be potentially caused by multiple brine aquifers within sediments over a vertical interval of more than 100 metres. As we indicated earlier, lithium prices have been extremely volatile for most of 2018. However, no discussion on mining stocks is complete without thoroughly assessing the commodity price environment. In the case of lithium, this is easier said than done. Lithium carbonate purchases are typically tied to longer term supply contracts between producers and customers, the terms of which are usually highly confidential. Furthermore, the type of lithium product and its quality in terms of grade will impact the price that it fetches. Lithium isn’t like gold, copper or oil where there is a firm spot price which is traded on an open market from day to day with clear visibility to all investors. In fact, so inexplicit are the pricing mechanisms that are characteristic of lithium that it only took one broker note in February to send the share prices of many stocks in the sector into freefall. That included big players such as Albemarle with its share price plunging from circa US$119 on the day prior to the note being released to US$95 only a week later. The group is yet to recover that ground, and is trading well shy of its 12-month high of US$145. While there are plenty of takeaways from the volatility that has occurred, these need to be put into perspective. As a backdrop, it was a report released by Morgan Stanley in February that triggered a substantial sell off in lithium stocks. The report forecast a surplus in the market by 2022 of 190,000 tonnes, resulting in predicted prices nearly halving to $7699 per tonne. While plenty of analysts dispute the broker’s view, the fact of the matter is that both the commodity price and the share prices of stocks exposed to the sector, particularly smaller companies, have fallen substantially. We should also point out here that broker projections and their views are only estimates and may not be met. Seek independent financial advice before taking a broker’s view into account. The other fact that perhaps provides some perspective though is that in the ensuing months Morgan Stanley and its subsidiaries emerged as a substantial shareholder in Australian lithium concentrate producer Galaxy Resources Ltd (ASX:GXY). Some leading industry figures took issue with Morgan Stanley’s outlook. However, perhaps the most reassuring data is a consensus snapshot of what analysts think of Albemarle. As reported by Reuters, at August 30, 17 of the 22 analysts that cover the stock have a buy recommendation on it. And in a show of self-belief, the Board of Albemarle recently voted to double its stock buy-back for the year to US$500 million. This reinforces the point we are making regarding RLC — the focus should clearly be on the company’s operational objectives and achievements rather than volatility in the lithium price. Can Drill-ready Lithium Brine ASX Junior Step Out of $15.8BN Albemarle’s Shadow?